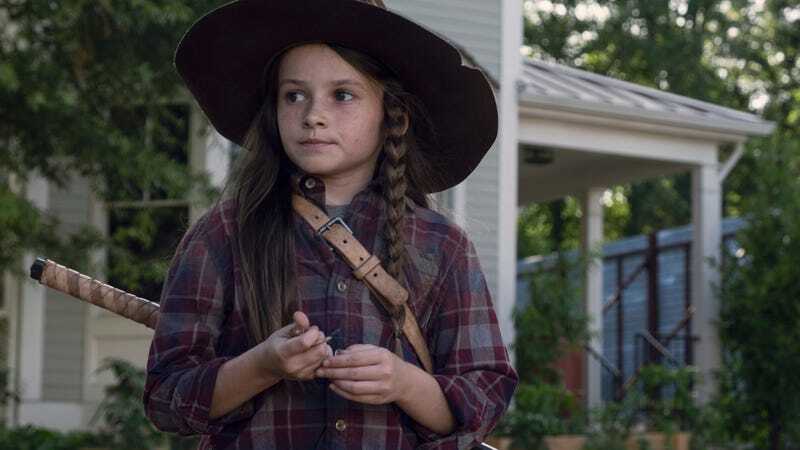 New Judith (Cailey Fleming) is absolutely not the problem. She totally rules. So when Judith brings those five new strangers into Alexandria, Michonne is not having it, even when Aaron tells her they very happily surrendered and handed over their weapons. So the council very briefly interviews them until an angry Michonne reveals that Magna, the surliest of the new characters, not only is hiding a prison tattoo—gasp!—but also a secret knife as part of her belt buckle. As Rosa later points out, having been in prison means absolutely nothing in the zombie apocalypse, and Michonne knows it, but she just wants to get people riled out so they’d vote to make the strangers leave, which they do. They can stay the night while Yumiko, the one who got the head injury last week, recovers from a concussion, but then they’re gone. It is, of course, a trap, from a group of ex-Saviors who have become essentially highway robbers, led by the jerk who held Carol at knifepoint a few episodes ago. Since she let him live then, this dude only steals the provisions on the wagon—not the wagon or the horses, and he’s going to leave them unhurt, too. That is, of course, until the dude also asks for Carol’s wedding ring, and Henry very very stupidly attacks him as if he’s going to defeat about a dozen people, many of them armed, with his stick. But they don’t even need the guns to knock the boy to the ground and give him a very mild pummeling. Then Carol sneaks out at night and burns the entire group of ex-Saviors alive—for hurting Henry, even though they were going to leave Henry alone until he attacked them. Sigh. Looks like Carol is back to her “no mercy only murder” philosophy, but whether that’s because of something that’s happened over the years or just because The Walking Dead thinks its protagonists murdering people who are not active threats in cold blood is cool again remains to be seen. Since this episode felt to depressingly like a throwback to the mire of seasons seven and eight anyway, I suspect it’s the latter, and that really blows. Speaking of fairs, the Kingdom is having one?! Who the hell knows how this is going to play out—I assume there’ll be jousting, because it’s the Kingdom—but it seems like people from all the colonies will attend, and Ezekiel hopes it will help unite them again. Not sure if funnel cake and a ring toss game will solve everyone’s problems, but I’m crossing my fingers.